Ananka's Diary: Swamp Sports Spectacular! 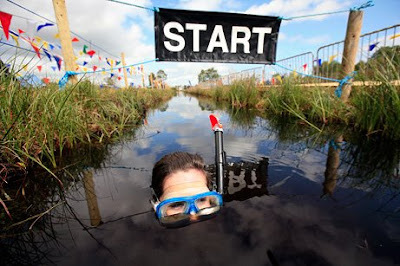 I read about bog snorkeling awhile ago in an issue of Muse magazine about celebrations. I also read a book about an Irish teenager who finds the body of an ancient girl in a peat bog. It's called "Bog Child," and I recommend it highly. Kirsten: Thank you, thank you, thank you! for the comment on my blog... it excited me so much and to hear you comment on one of my writing projects was like a dream come true for me. I think that being a critic would be fun, but my ultimate dream is to be an adventurer, be an travel/adventure columnist and then write a fictionalized novel about all of my experiences. Right now I'm working on a novel about a girl who is a history genius and goes on a archeology adventure. It an adventure/coming of age story. I'm so sorry for rambling! bog swimming??? i could never do that. i get creeped out when i cant see very well underwater in natural places to swim, and underwater moss/plants just freak me out. i hate fish for some reason. they have big googly unblinking eyes and theyre slimy(i think). The word bog reminds me of the toilet. Haha. i'm not sure i would like that, but i'd be a bit more worried about the wildlife. Oh gosh! That'd be quite the experience, haha. I might if I had a wetsuit, mouthpiece so I wouldn't swallow anything, and a written guarantee of no dangerous animals attacking me. This is totally unrelated to this particular post, but I just wanted to thank you Kirsten for writing the books. I love them so much still. :) I recently had one come in handy when I found an earring on the ground that looked like a diamond! I used most of the tips you wrote in the first Kiki Strike, and discovered it was not a diamond sadly. :( Took it to the jeweler just in case, and he confirmed. Ohhh well, it was fun testing to see if it was one or not. That sounds so interesting but no way would I ever do it! I just missed it! Argh! Well maybe another day! Has anyone read the story of that ice man? a body was found buried in the ice. and preserved. but looked exactly like the bog mummy!